A Physical Therapist Assistant (PTA) works as a member of a health care team that provides direct patient care. 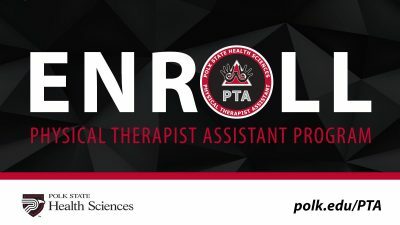 PTAs work under the direct supervision of a licensed physical therapist to provide hands-on treatment of patients to relieve pain and improve function. Various therapeutic modes of treatment may be utilized, including heat, cold, light, water, electricity, sound, massage, and exercise. The Physical Therapist Assistant program is a 74 credit-hour program. There are 29 credit hours of program core courses, including 17 credit hours of general education. Included in the professional courses are three clinical experiences. 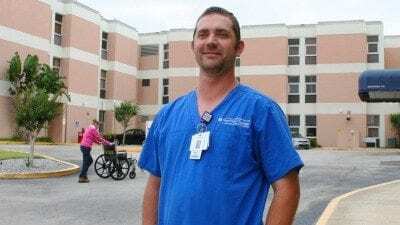 Graduation from the program qualifies the student for examination for licensure by the Florida Board of Physical Therapy. See the available program curriculum sequence here. The following is an estimate of the expenses for a resident of Florida to complete the five semesters of the professional curriculum. These expenses are subject to change without notice. *These are only estimated costs. **Based on tuition in 2017-2018. A new cohort of 24 students is accepted and begin the program each fall semester. Students seeking admission must first be admitted to the College and complete all prerequisite courses, 50 observation hours, and submit an application to the program during the application period (applying to the program does not guarantee acceptance into the program). A total of 11 credits of general education requirements need to be completed before starting coursework in the PTA Program. The remaining 6 credits of general education courses may be taken in conjunction with PTA Program coursework. PTA courses consist of a total of 57 credit hours, 13 of which are clinical practice in community clinical sites. The PTA program is offered on the Winter Haven campus. Classes are scheduled Monday through Thursday primarily daytime with some evening hours. Graduate and employer surveys indicate that 100% of graduates who had passed the licensure exam are employed as physical therapist assistants within 6 months of passing the licensure exam. Following completion of academic and clinical work, graduates of the program will be able to sit for the National Physical Therapy Examination for the Physical Therapist Assistant and the Florida Jurisprudence Examination. The exams are administered by the Professional Examination Service of Federation of State Boards of Physical Therapy (PES/FSBPT), 475 Riverside Drive, New York, NY 10115, Phone: 212.367.4200. Physical therapist assistant salaries range from $33,000-$55,000 depending on the region and/or type of setting.